The Fulcrum Institute aimed to prepare a group of Educators in Science who would implement and lead research-centered science learning and teaching in their schools and districts. The vision was for participants to advance their professional knowledge and status and become teacher leaders who understood science more deeply and promote it in their classrooms and schools. Such leaders know from personal experience that thinking needs to be grounded in observation, yet nurtured by competing claims and possibilities. They regard science as more than a body of existing knowledge, but more as a means for understanding phenomena and for figuring things out in the world around them. Fulcrum Institute has worked with over 100 elementary and middle school teachers, many from high need districts. By their own testimony and the evidence collected by external evaluators, the experience of taking the Fulcrum online courses and working with scientists during the face-to-face summer institute has been one of extraordinary growth. This growth is demonstrated in terms of the teachers' own intellectual development, as well as their skills as nuanced teachers with deep insights into the science learning of their students. 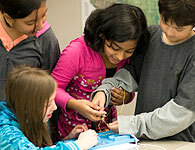 As a result of the efforts of those involved in the program, and in response to the growing need for science teachers at the elementary and middle school level, Tufts University has approved a Master of Arts in Science Education and a Certificate in Science Education.